Aside from being this week's DVD release date, October 21st was also International Day of the Nacho! I know! Invented by Ignacio Anaya - 'Nacho' to his friends - as a dish made from leftovers for the wives of American soldiers out on a shopping trip, nachos are a terrible cinema snack but a perfect home movie snack. But which DVDs won't make you vomit your nachos out in disgust? Let's find out! 'Hummingbird' (★★½) was released under the title 'Redemption' in America, which is a shame because it leads viewers to the crux of the film before it's even started. Not that 'Hummingbird' is particularly great as a title either, and both blanch after the French title 'Crazy Joe'. 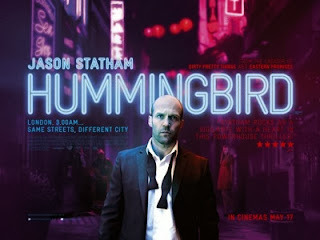 At any rate, 'Hummingbird' isn't your average Jason Statham action film - for a start it's not really an action film at all, it's quite a talky thriller. Statham plays Joe, a former Marine with post-traumatic stress disorder, now reduced to living on the streets. When his friend is murdered he decides to get his life back together to take revenge. He gets pretty ‘crazy’. It's a lot more character-driven than it sounds, much of the film seeing Joe trying to decide what he wants and having taut, expressive dialogues with Agata Buzek's troubled nun. That's not to say there's no action at all - there are fight scenes but they're not the action film style of back-and-forth brawls which the story is built around, they're a character using violence as a way of interacting with their world. The fight scenes are necessary for the characters, and the film is an expression of that. The grimness of 'Hummingbird' is perhaps unsurprising given writer-director Steven Knight's previous work in 'Eastern Promises', and the tone fits Joe's form. But for all that Joe is a compelling character, the nun really isn't. There's not enough of her to fully realise Knight's intentions, but too much to consider her only in relation to Joe's story. At 93 minutes, maybe it would have been a worthwhile investment to flesh out her character at the expense of a screening-friendly runtime. 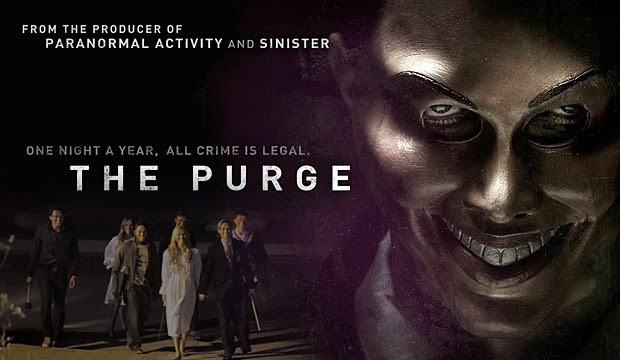 'The Purge' (★★), however, couldn't be short enough. Written and directed by James DeMonaco, it's set in a near-future America where every year, for 12 hours, all crime is legal. Ethan Hawke is a salesman of security systems that allow the wealthy to seal off their homes for protection during these Purges, but the systems are not quite as safe as he makes out. Part home-invasion thriller, part social-commentary, 'The Purge' turns an ostentatious premise into a lacklustre experience. There are obvious unanswered questions about the nature of the Purges that many other reviewers have brought up, such as 'To what extent are preparatory or complicit acts legal before a Purge' and 'What about time-zones?' The point of the Purges, as the film implicitly states, is to foster social and economic progress through elimination of the weaker elements of society in a process which also provides catharsis. While the criticism of this position is handled without preaching, I'm not really sure we need it in the first place. Isn't such a system obviously callous and morally unsteady? In terms of actual plot, 'The Purge' is awash with borrowed ideas and cliché. The annoying son of Ethan Hawke and Lena Headey plays with a mini robot he made out of a broken baby-doll and wheeled platform. That's just a collision of the annoying son in the 'Lost In Space' movie and the creepy baby-doll from 'Toy Story'. And we're all familiar with horror films where the protagonists split up for no good reason, thus putting themselves in greater danger. Here, it happens throughout. The kids of Hawke and Headey are constantly wandering off and nobody ever knows where anyone else is. Half the film is people searching for each other. Another demonstration of lazy writing is the trope of a villain standing over a protagonist about to deal the death blow when -gasp!- they're shot by someone off screen! 'The Purge' is overpopulated with these dei ex machina, the trope being played out a wearying three times. So if you've decided to watch a dumb film this week, you're a lot better off going with 'World War Z' (★★★). Originally intended to be an adaptation of Max Brooks' novel of the same name, it was later turned into an action film bearing minimal resemblance to the original novel. Starring Brad Pitt as a UN investigator, director Marc Forster takes us on a journey round the globe to find a cure for the zombie plague that's demolishing civilisation. We're taken from the burgeoning conflicts in America to a UN fleet in the Atlantic, where Pitt's family get stashed. Then to Korea to see the first victims of the plague, Israel because they've been acting suspiciously, and Wales to visit a WHO research facility. Scenes of devastation obtain everywhere, except in Wales where there's no discernible difference, and Pitt is kept constantly moving by zombies far more vicious and frenetic than any previously captured on film. It's a zombie movie for a globalised age - these days shopping malls and farmhouses just aren't enough for the kids. Fortunately, the frequent changes in location allow for an energizing variety of action settings. The claustrophobic corridor-based early scenes give way to aeroplanes, military bases and urban sprawls. There's even a stealth section in the research facility, which further convinces me that as videogames become more like films, so films become more like videogames. 'World War Z' revels in its genre, and fully commits to its character archetypes. Outstanding is a Harvard virologist, who naturally is young and photogenic, and talks entirely in metaphors - setting them up and coldly murdering them over a five minute period, like every movie scientist amplified to World War proportions. As far as the film is played seriously, it's all so manic and overblown it looks like someone took two or three action films and crushed them into one. So this week there are lots of old films posing as new films - all very glitzy with nothing truly original in any of them. But International Day of the Nacho is about leftover ingredients being combined for fun, throw-away calories, and the most fun movie this week is 'World War Z', with 'Hummingbird' too caught up in its character-driven grittiness and 'The Purge' being dull as mud. Enjoy nachos responsibly. Also out this week is on DVD is 'The East', which I previously reviewed here. Find more from Max at @maxltj and read previous DVD Digests here.